It’s a Rosie the Riveter world. Well isn’t it? It’s an “I Can Do It!” world. Well don’t you believe it? OK, so that’s a bold statement. But just look around at this world. Just look at TV for instance. What do you see, all over the television? Do you see the hero of the story, waiting on God for help? Of course not! The hero of the story solves the big problem by his own (or her own) “brain or by brawn”. Correct? Try to think of one TV show, in which the hero allows God to solve the big problem. Even the TV series with a religious bent usually has the Christian character solving the big problem by human effort. And have you ever noticed that the secular shows, more often than not, portray Christians as “weak little birds”, and at last are saved by the big strong secular hero of the story. Yes, it’s a Rosie the Riveter world. And it’s been that way for a very long time! Even in the Garden, when the Tempter tempted the woman, it was over the issue of her wanting to be like God. She didn’t want to trust in God. She wanted to do things under her own strength and intellect. 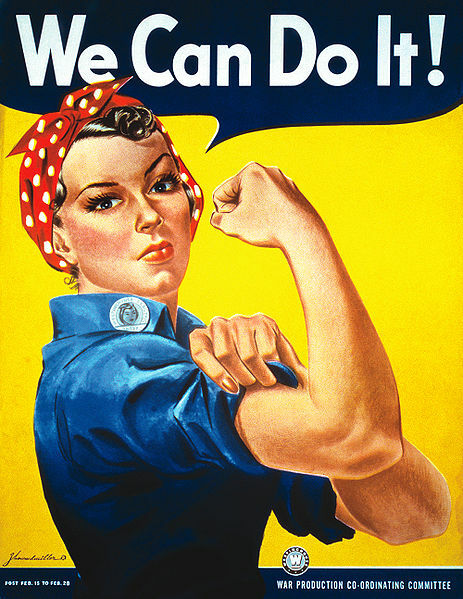 Yes, in a very real sense, Eve was the very first Rosie the Riveter! And all God originally wanted, was for mankind to enjoy peace and rest and happiness. But when mankind left God’s Rest, and wanted to have a “We Can Do It!” world, God in His infinite wisdom decided to allow us to become that kind of a world! And so we became a “We Can Do It!” world. Not so good, is it? Just looking around, one might assess the situation as well, perhaps, a total flop. But the very good news is, the door is still open to come back to God. But one caution. If a person decides to come back to God’s Everlasting Rest, just don’t try to bring that “We Can Do It” philosophy into God’s Rest. It won’t work. No, the Christian must totally re-learn a completely brand new way of doing things. Listen to the Psalmist of Israel… “LORD, my heart is not haughty, nor mine eyes lofty: neither do I exercise myself in great matters, or in things too high for me. Surely I have behaved and quieted myself, as a child that is weaned of his mother: my soul is even as a weaned child.” Psalm 131:1, 2. David was king of Israel, and yet he knew how to let God be the One to rule, placing his trust fully in the Lord. And yes, as the Christian learns more and more about the Bible, he or she will learn to put greater and greater trust in the Lord, to solve the many problems of life. You may also go to Part 3, or Part 4, of this “Planet Of Rest” series.